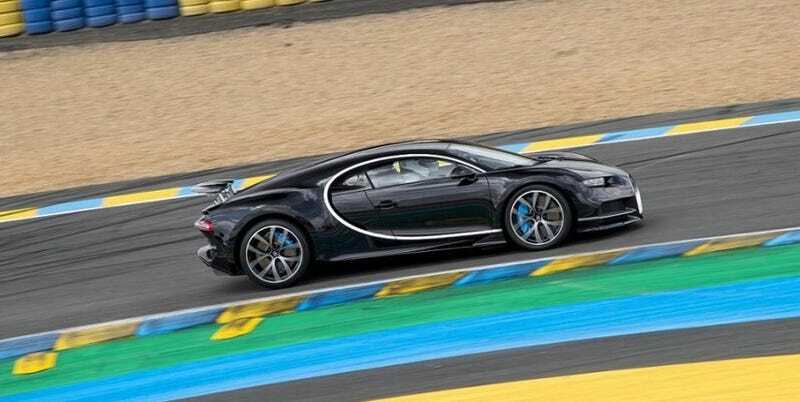 While we don’t yet know the Bugatti Chiron’s top speed, we now know this: At the hands of Bugatti boss Wolfgang Dürheimer, it hit 236 mph during a lap of the track during pre-race festivities at the 24 Hours of Le Mans this past weekend. That is very fast. In fact, it is 23 mph faster than the Audi R18 prototype racer, the fastest current top LMP1 prototype racing on the Circuit de la Sarthe. That’s also nine mph faster than the 227 mph top speed of the Nissan R90CK, which recorded back in 1990 the fastest race car top speed on the Mulsanne Straight with speed-dropping chicanes. It should be noted that ballistic top speed isn’t a top-level priority for Le Mans prototypes, as Road & Track points out. The huge amount of downforce that the race cars generate is a testament to that fact. All of that is why, even though the Chiron weighs more than a prototype racer and they both have four-digit power outputs, this isn’t terribly surprising. If this lap at Le Mans (with its speed-reducing chicanes that were implemented at the Mulsanne Straight in 1990) is anything to go by, we are definitely in for something awe-inspiring. There aren’t any chicanes at Ehra-Lessien.